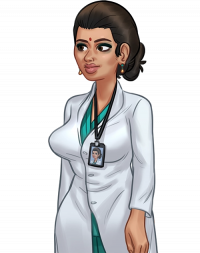 Dr. Priya Singh is a doctor in charge of the research lab on the third floor of Summerville clinic. Comes across as overworked and stressed out, constantly shouting at the main character for trespassing on the third floor of the clinic. She is nice underneath all that, even to go as far as letting the Main Character try out a experimental drug to improve his sperms potency.